The Asian elephant has been bred in 13 countries, and 5,000 elephants are currently found in Thailand. Among those, 2,000 are wild and 3,000 are domesticated. Nowadays, the number of wild elephants is reduced to an alarming amount due to hunting, their illegal use in the logging business, and the destruction of their habitat. Many elephants have been displaced or are in poor situations. One of the most important factors of wildlife extinction, unnatural livelihood, deeply concerns Her Majesty the Queen, who graciously granted an initiative to save the Thai elephants, especially from the threats of their illegal use in the logging business and of poor situations. In response to the royal goal of conserving wildlife and endangered species, the Elephant Reintroduction Program was formed in 1997 under the royal patronage of Her Majesty. Its aim is to be an important measure in solving the domesticated elephant problem as well as restoring the Thai elephant population through the concept that “a domesticated elephant is a wild elephant.” The elephant is the only animal that humans can’t change into fully domesticated animals which are unable to survive in the wild again. In 2002, Her Majesty the Queen gave the royal permission to form the foundation, underpinning the long-term implementation of the program. She graciously granted the name “Elephant Reintroduction Foundation.” The Foundation’s symbol is a sky blue elephant surrounded by green Bodhi trees, decorated with Lai Rod Nam, with the initial name “Sor Kor” placed under the royal crown, which is on top. The insignia represents Her Majesty’s compassion towards the Thai elephant conservation and desire to eventually turn the area that has become deteriorated into abundant forestland. Throughout the over six years of implementation, the success of the project has been widely recognized for the nation’s capability in wildlife conservation. Study and research on elephant manners has been seen continuously to be important by experienced professionals and veterinarians. This is considered the first time that the domesticated elephant has been returned to its natural habitat and studied subjectively and systematically. Returning domesticated elephants to their natural environment will help rehabilitate the wildlife population as well as prevent extinction, as well as provide a better situation for those domesticated elephants which are no longer used for work as a result of the forest concession termination in 1990 and 1991. The World Wildlife Foundation International (WWF International), where Prince Phillip, Duke of Edinburgh, Consort of Queen Elizabeth II, is the executive chairman of the organization, also provides a joint effort to conserve wildlife. Through his kindly support, Prince Phillip graciously granted the initial fund for the foundation’s set up. The program has also caught the interest of and drawn collaboration from other nations and international organizations as well. 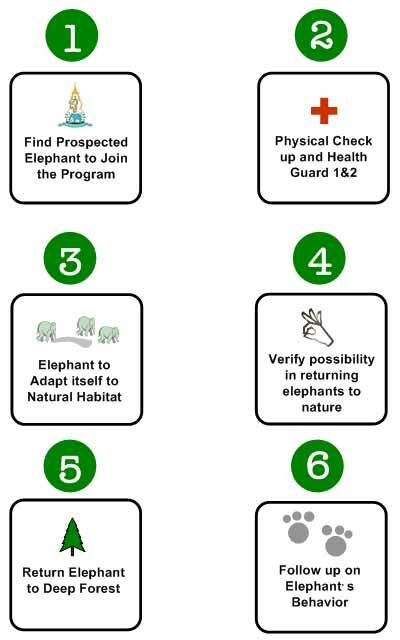 Seven years after implementing the Elephant Reintroduction Program, it is evident that the twenty-four domesticated elephants released at Doi Pha Muang Wildlife Sanctuary Area, Kaeng Ka Charn National Park and Mae Wa-Mae Wok National Park have adjusted themselves and are getting along with the natural environment. Some of them have permanently returned to their homeland, whereas the others are kept in Natural Reserved Forest, Lumpang province, and have taken physical recovery before being let back to their homeland. February 18, 1999 Ex-Governor of Lampang Province and Director of the World Wildlife Foundation International (Thailand) presented Pang Kammool and Plai Song, to Her Majesty the Queen. The cow elephant and her young boy were adopted into elephant reintroduction program since then. February 10, 2000 Thanks to Her Majesty’s Compassion, Sidoyali, Pang Boonma, Pang Khammool Yai, Pang Chumpi, Pang Thongbai, Pang Boonmee, Pang Kongma, Pang Bua Nguen and Pang Buatong are brought into the elephant reintroduction program. Currently, these nine elephants are under the physical recovering process. ............... 2000 Plai Sri Sakorn, an orphan elephant being wounded from a shot was presented to Her Majesty. Plai Sri Sakorn had been under medical treatment and lived with his three babysitters in Mae Yao National Lumpang province in order to adjust itself to natural forest. February 10, 2001 To promote friendly ties between Thailand and Denmark, under royal command of His Majesty the King and Her Majesty the Queen, Her Royal Princess Maha Chakri Sirindhorn accompanied Queen Magreth II of Denmark and Prince Henrik on the royal visit to release a cow elephant “Pang Boonrod” into Doi Pha Muang Wildlife Sanctuary Area. 888 I Tower Building, 18th Fl., Vibhavadi Rangsit Rd, Khwaeng Chatuchak, Khet Chatuchak, Bangkok 10900 Thailand.